Typically used to secure most commercial applications. They are ideal for securing schools, sporting pavilions, hospitals, shop fronts, entrances and alcoves, kiosks, storage areas and shelving and serveries. Adapting this shutter system to domestic applications allows the homeowner to cover very large window, doorway, pergola and veranda openings using one shutter, alleviating the unsightly need for centre mullions. Verandas and Pergolas can now be used as a secure additional room, protected play areas or entertaining areas. The AR32 Roller Shutter with a standard density core is designed to cover widths of up to 4.2 metres in one span whereas the SAR132 with a high-density polyurethane core is designed to cover widths of up to 4.8 metres. 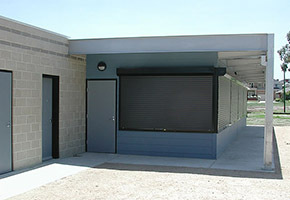 Unlimited spans can be achieved by permanent or in most instances removable mullions. Bulkheads and specifically the lack of room has been a key issue and most retailers, shopfitters, builders and architects are searching for security rollers shutters that provide a compact roll diameter. Both these shutter profiles roll onto axles of 60mm and up to 102mm in diameter overcoming most bulkhead restrictions or can be incorporated with Eurotec’s Compact German Box Pelmet system for any external roll diameter requirements. The SAR132 security roller shutter systems has an additional feature of security storm clips which are screwed into the high density polyurethane core, locking into the inside of the 80mm extruded tracking system satisfying the demand for extra strength and security in high wind areas. 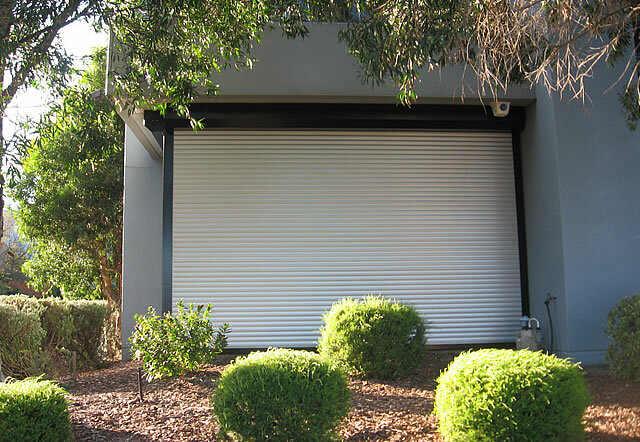 The high-density core is so rigid there is very little deflection and combined with storm clips makes it one of the strongest roll formed security roller shutters on the market. Most security shutters can be manually operated, although motorisation can be adapted in almost every instance. 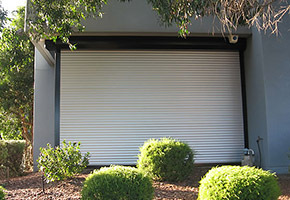 Manually operated security roller shutters incorporate an assist torsion spring, which is designed to counterbalance the weight of the shutter promoting ease of use. A ‘D’ handle can be fitted to assist in the raising and lowering of the security roller shutter. AR32 & SAR132 security shutters slide into extruded aluminium tracks that are three times the strength and thickness of conventional side guides which also provide a solid anchoring point to effectively lock the curtain in position for extra security.